Decorative concrete applications are becoming more and more popular in both commercial and residential situations in Harford and Cecil Counties, as well as elsewhere in Maryland and Delaware. 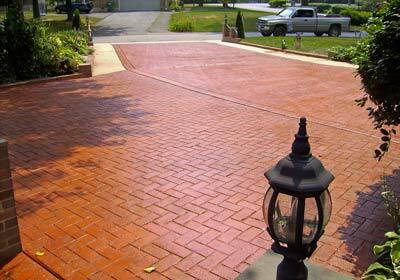 Using color-stained or stamped/textured concrete can dramatically improve the visual appeal of a previously boring driveway, patio or storefront, and allows homeowners and business owners to add personality to their architectural presentation. While "decorative concrete" use to mean concrete that had either (a) varying degrees of exposed stone, or (b) been painted or otherwise color-coated, advancements in concrete chemistry have dramatically improved the versatility of concrete as a landscaping and architectural medium. In fact, the look, long-lasting durability, weather-resistance and overall strength of concrete have been significantly improved over the past 20-30 years. Visit our concrete color provider's website for the various integrated concrete stain colors and topically applied concrete color-stain choices. If you are a Harford, Cecil, Kent, or New Castle County business or home owner, trust Maryland Portable Concrete to help create that beautiful, long lasting, decorative concrete patio, driveway, or architectural feature that will make your home, store or office building truly unique. 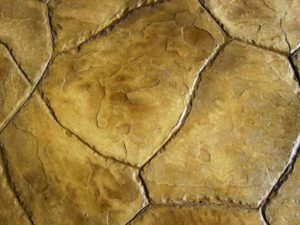 Please visit the pages listed above for more information on the types of decorative concrete, their most common and interesting applications, and to view representative photos.